Andrew Purchin is an interdisciplinary artist who practices painting, performance and psychotherapy. His work has been exhibited in Pakistan, New York, Vermont and California. Purchin started painting seriously when he was 16. Influenced by his father’s filmmaking, Purchin has always been entranced by motion and the spaces between this and that. In the last twenty years, Purchin has been painting on site, be it landscapes or at events such as weddings, memorials or at historical moments. He has created on site paintings at the 2009 and 2013 Presidential Inaugurations, the “We Are One” concert in Washington DC and at TEDx Santa Cruz in 2014. In 2010, Purchin founded the “Artists Everywhere Project” in which he installs artists who create work in public so as to shift the paradigm so that art-making will be as popular as the playing of sports and the shopping for things. These efforts have developed into “The Creative Witnessing Project”—making art at sites of tension, conflict and violence. Purchin campaigned for the making of art everywhere by everybody by making art in public at the Republican and the Democratic national conventions in the summer of 2012. 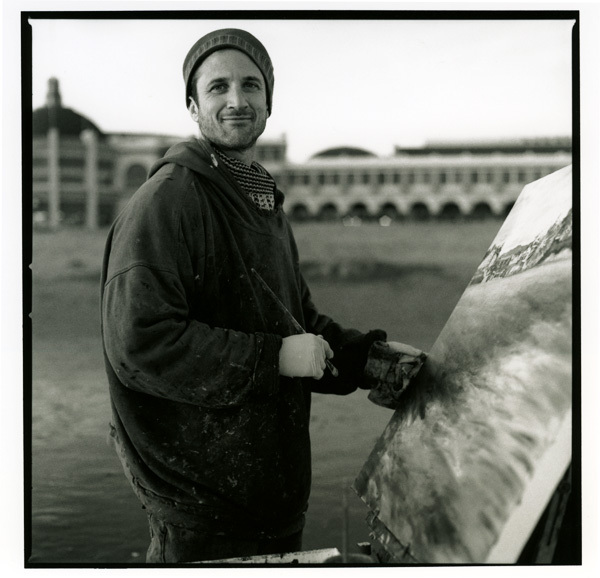 He organized “A Thousand Artists: A Public Art-Making Installation” at the 2013 Presidential Inauguration in which over a hundred people made art amongst the spectators and was featured in numerous media outlets including the San Francisco Chronicle, the Washington Post and KQED radio’s California Report. In 2011, Purchin began a collaborative art making friendship with Pakistani Artist -Mohsin Shafi via the Internet: creating portraits via skype, videos, installations and collages. In May of 2014 the two met in person for the first time to create the exhibit “Encounters on the Frontier,” at the Zahoor-al-Akhlaq Gallery at the National College of Arts in Lahore, Pakistan. Purchin was awarded a grant from Arts Council Santa Cruz to create the exhibition: “Encounters on the Frontier: UPSIDEDOWNLAND” with Mohsin Shafi at the Radius Gallery in July of 2015. In 2016, Purchin organized “The Curious End to the War Against Ourselves” which was a public art making installation at both the Republican and Democratic National Conventions. Well over a hundred participants drew and painted on a 180 foot scroll as they listened to an art making meditation that guided them to let go of judgement of theirselves and others. Purchin has been an artist in residence with The Fields Project on two occasions in which he lived on farms in Ogle County, Illinois sharing his art process with the farmers as he painted scenes from their lives. Purchin’s work has been published in American Artist, in the Santa Cruz Cultural Council Calendar for 2007-2008 and most recently in the Catamaran Literary Reader (issue six). Purchin was awarded a partial fellowship to Vermont Studio Center where he was artist in residence in 2005. Purchin’s work has been exhibited and honored in many venues including the office of California State Senator Bill Monning, The Triton Museum in Santa Clara, Lana Santorelli Gallery in NYC (Chelsea), The Santa Cruz Museum of Art and History, the Santa Cruz Art League, The Santa Cruz Institute of Contemporary Arts, Sanchez art center and Atelier Gallery. Purchin has been juried into Santa Cruz County Open Studios Art Tour for ten years.